You need a quality cordless drill, but you have less than $100 to spend on it? Don’t worry – contrary to what you might think, there are plenty of quality options that you can purchase for $50 or less. Finding the best cordless drill for the money requires you to cast aside some features that are nice to have, but not necessary, so that you can buy a drill that packs in the features you need without sacrificing quality. Low budgets don’t always mean cheap! Our guide features five of the best cordless drills that you can buy without spending hundreds of dollars. BLACK+DECKER BDCDD12C 12V MAX Lithium Drill is a compact, budget-friendly drill from one of the most well-known brands. Although small, this drill is still powerful enough for most heavy woodworking projects. 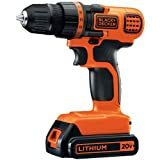 For more power without sacrificing a strict budget, the BLACK+DECKER LDX120C 20V MAX Lithium Ion Drill/Driver has variable speeds and a 20-volt battery while still staying under $50. If you already own other Ryobi power tools, the Ryobi P208 One+ 18V Lithium-Ion Drill/Driver may be your best option. It comes without a battery, but other tools from Ryobi have compatible batteries you can use to save some money. For less than $50, you can buy the Tacklife 12V 2.0Ah Lithium-Ion Cordless Drill Driver Set, which not only comes with the drill, but also a case, charger, battery, and a bit and driver set to help you make the most of your money. The WORKSITE 8V Electric Cordless Drill may be the best, most budget-friendly option for DIYers with light household projects that don’t require much drill power. The 16-position clutch can still handle most jobs around the home. The following reviews cover five of the best cheap cordless drills based on their features, performance, and customer reviews. This drill from BLACK+DECKER sits at the lowest price point on our list at under $30! This 12v drill is tiny, but that doesn’t mean you should underestimate its power. You can choose between 11 clutch positions to match the needs of your project. The motor allows for up to 550 RPMs, which is just the right amount for most light tasks and jobs around the home. 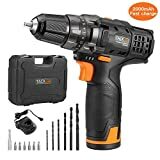 Most drills at this price point come with a standard alkaline battery rather than a lithium-ion battery that can give power to the drill for longer and have a more extended life. This battery can also hold a charge for several days to weeks after use without needing to be charged again. Several people who have purchased this drill are surprised by its versatility for such a low price. Customers have done everything from mounting TVs to creating wood furniture with this BLACK+DECKER drill. This BLACK+DECKER drill is a significant step up from the 12-volt model for about $20 more. You’ll still have an 11-position clutch for control over its power and rotation, but you’ll get some more torque to deliver a powerful drill for heavy-duty wood projects and light metal work. This variable-speed drill is one you can adjust to the needs of your project by pulling or depressing the trigger, with a motor that rotates up to 650 RPM. Right above the trigger is an LED light that turns on when you use the drill to illuminate your work surface. The 20-volt drill is heavier and a little bulkier than the 12-volt model, but several customers praise its design that offers a comfortable grip and a balanced feel throughout the tool. If you currently own a Ryobi power tool that uses one of its 18-volt lithium-ion batteries, then you might want to consider purchasing this cordless drill. The drill is less than $40, and many other Ryobi tools use the same battery you’d need to power it, which can save you from paying extra to get a drill with a battery included. The Ryobi has a unique design that’s meant for comfort. It’s compact and lightweight, but it also has a rubberized grip handle to keep it from slipping while you work. On the base of the drill is a small magnetic tray that’s just the right size for holding your drill bits or screws in place as you work. This powerful drill has 24 clutch positions to choose from. Combined with its variable-speed trigger, you’ll have a wide range of power and speed to get just the right control over your project. The compact Tacklife cordless drill is one you might want to consider if you’re looking for the most bang for your buck. This drill comes in a set that includes the battery, charger, storage case, and even a set of bits and drivers to give you everything you need to get started. The drill isn’t the most powerful one you’ll come across, but it should do the trick for general woodworking and household duties, like drilling holes for picture hanging or TV mounting. With a 19-position clutch, you’ll get some flexibility with its power and rotation. The drill also has a light for precision work and a convenient battery power indicator to let you know when the battery needs a recharge. Most customers agree that the drill works well for what they bought it for – light drilling and driving tasks – but some are disappointed in its inability to handle tougher work. For simple projects on a budget, the WORKSITE 8v Electric Cordless Drill could be an excellent option. 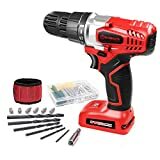 You won’t spend over $40 on this drill, which includes helpful accessories like a bit and driver set and magnetic wristband to keep bits close to you as you work. This WORKSITE drill has an easy-to-adjust variable speed trigger to give you control over rotation speeds. You can also adjust the 16-position clutch to provide more or less power to the drill, depending on the project you’re working with. This drill is incredibly lightweight at less than two pounds, so customers with hand and wrist pain love how easy it is to maneuver without weighing them down. However, some customers have commented that it’s almost too lightweight and doesn’t feel quite sturdy enough for their preferences. Budget cordless drills aren’t worthless! For the casual DIYer, finding the best cordless drill deals can save a lot of money while still giving you a tool that does what you need it to. Some drills are best for light household DIY projects, while others are heavy-duty and powerful for tougher projects, like drilling through metal or masonry. Depending on what you need your drill for, you should always be able to find a budget-friendly option without paying for features you don’t need. Take a good look at the features of drills you’re considering and compare them. You’ll probably see that the drills with higher price tags have some beneficial, but not necessary, features, like an extra battery or a keyless chuck. When it comes to finding the best cordless drill for the money, one of the first things you need to look at is the drill’s battery power. Cordless drills come in a variety of battery voltages, which can influence how powerful they are and what kind of projects and materials they’ll work with. Voltage is also one of the features that will boost up the price of a power drill quickly, so if you only plan to use the drill for quick, light projects around the home, a low-voltage drill set at a low price point could be the best option. Drills with 4 to 10 volts can meet the needs of general DIYers who use them for light work. For jobs that might need some more power, like working with hardwoods or light metals, you’ll need to look for a drill with 12 to 20 volts. A brand name isn’t always as important as it seems when choosing a cordless drill. Purchasing a drill from a brand that you haven’t heard of can save a lot of money over buying a similar one just to get a popular brand name. Before you purchase an off-brand drill, read its reviews. In some cases, you might be surprised to find that people have had great experiences with the tool, maybe even more than a comparable drill from one of the top brand names in the industry. Your cordless drill, of course, needs a battery on which to operate. But, some cordless drills don’t come with a battery. If you don’t already have another power tool from the same brand that uses the same battery for the drill, you’ll need to purchase a compatible battery separately. However, many power tools by the same brand will have batteries that you can use in the brand’s other power tools. Sometimes, it might be worth it to buy the power drill by itself, using a compatible battery that you already have in your garage and saving the purchase of an extra battery for another time when you have some extra cash to spare. We’ve covered several excellent options for budget-friendly cordless drills that can work well for most household projects and beyond. 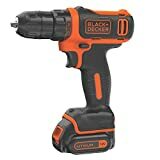 However, we believe that the BLACK+DECKER BDCDD12C 12V MAX Lithium Drill is the best option for most general drilling and driving needs, and its price falls just under $30. This super compact, lightweight drill is surprisingly powerful with its 11 clutch positions. Although it doesn’t reach the top speeds of some of the other drills on our list, it can still provide enough power for most around-the-house and woodworking projects. We also like that just about anyone can use it, even if they lack hand or arm strength or have tight spaces to fit the drill into. Its small frame is easy to hold and maneuver. Whether you’re looking for a drill that can stand up to metal or the cheapest option for light tasks, we hope that this guide leads you to find the best cordless drill for the money you can spare.